Diane Huntress is a Denver-based photographer who is known for her responsiveness to clients and experience in collaboration. Oh, and great work too. 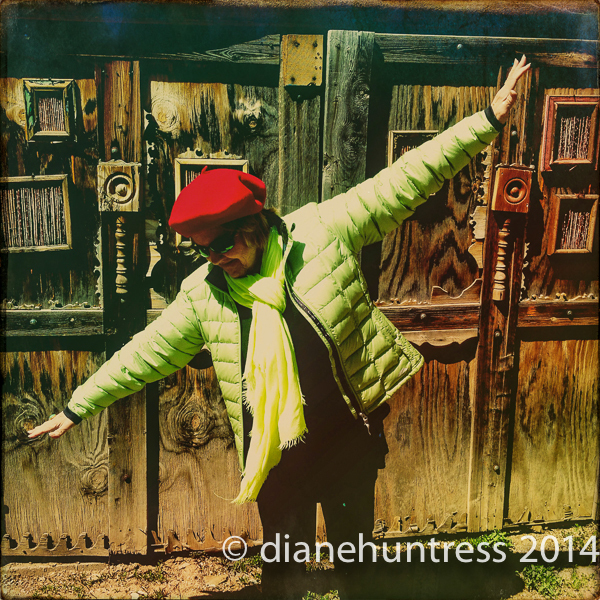 Portrait of photographer in lime green and a red beret in front of original wooden door in Santa Fe, New Mexico. Diane Huntress Photography was founded over 20 years ago, and has been providing quality content ever since. Business is located in downtown Denver, Colorado, I contract with the best assistants and suppliers to provide a professional experience for clients. Diane Huntress Photography is as resourceful a business as you will ever work with. Diane Huntress has been featured in American Photo and Pentax Life. Celebrate the individual. The path to creative portrait photography started with fine arts education starting in grade school to Kansas University, Denver University and the University of Colorado at Denver. The world-class portraiture distinction followed Diane’s coverage of events and the people in World Cup Skiing, Rugby, America’s Cup Racing and fine art photography. USA: 303-534-4498 – the studio number is on temporary suspense while I am in the EU. You can reach my EU mobile: 011-385-95-5114-268 for now. Thanks! I am looking forward to hearing from you!